"Change and growth take place when a person has risked himself and dares to become involved with experimenting with his own life." Yesterday was long and draining and as a result, I woke up very tired today. To prepare for a work day I wrapped up a trout fillet and some rice in foil and seasoned it with a little salt and a touch of honey. I didn't have much to eat for breakfast other than rice and water. At lunch time I broiled my fish and rice and it made a big difference in my energy level. I also received a wonderful gift from my patient, Renee. She has a flock of chickens that she raises nearby for their eggs and she donated a dozen newly laid eggs to my cause! How about that? I was so excited to taste something other than trout and rice. During my lunch break I soft boiled an egg and pealed it perfectly. I cut it in half and sprinkled a little sea salt on top and it was the BEST tasting egg I think I have ever had. Thanks Renee! FYI - to make the best soft boiled egg, boil about a half inch of water in a very small pot with a lid. Then put the egg in and cover for exactly 5 minutes. Rinse under cold running water and peel. Then cut it in half and sprinkle a pinch of salt on top. The warm runny yolk is so good and 5 minutes is the precise amount of time to fully cook the whites while leaving the yolk a perfect consistency. So good. I have a love/hate relationship with my senses during the SDC as they start to become much more acute. That's the love part. The hate part is the fact that I have to deprive myself of all things yummy so that I can appreciate the love part. Everything smells so delicious to me now and every new food is like a million taste buds exploding in my mouth with flavor. So far my squirrel trap has failed to do its job. No surprise there. I've been outsmarted by these critters every year. I did a little more research into humane trapping methods and I saw a contraption that is designed to catch mice. I thought I could modify it a little in order to trap a squirrel. It's a pretty simple design and I had all the stuff I needed right in my garage and back yard. I quickly assembled a 'prototype' and hung it from a tree with some bird seed for bait. It's called the "Walk the Plank Trap" and it's designed to have the target animal walk out on a long plank to get the food/bait. As it gets to the end, the plank tips down from the body weight of the animal and it falls into a large garbage pail. The mouse version has them falling into a bucket of water where they drown. My squirrel version just has a large round garbage can. 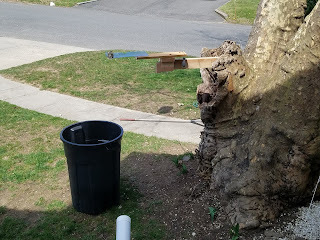 First I'll see if it works but then I may need to modify the garbage can a bit so the squirrels can't jump or climb out. After work I hope to put together the smoker grill and at some point I'm going to have to clean up the bee hive because I think the bees will be arriving soon. I ordered them two months ago in preparation for this. Good news on the green food front. The first asparagus has arrived! And not a moment too soon. 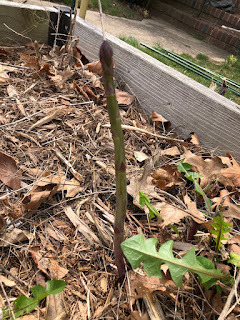 While clearing out debris from the garden today, Debbie spotted the asparagus stalk (ready to eat) as well as some broccoli rabe leaves, some kale, wild garlic and of course some dandelion greens. After almost a week of no greens, I'm really missing them in my diet. The dark leafy green vegetables should provide a boost of vitamins and minerals that my fish and rice alone could not.